New measurements of the cosmic microwave background (CMB) – the leftover light from the Big Bang – lend further support the Standard Cosmological Model and the existence of dark matter and dark energy, limiting the possibility of alternative models of the Universe. Researchers from Stanford University and Cardiff University produced a detailed map of the composition and structure of matter as it would have looked shortly after the Big Bang, which shows that the Universe would not look as it does today if it were made up solely of ‘normal matter’. The QUaD collaboration uses the 2.6-meter telescope shown here to view the temperature and polarization of the cosmic microwave background, a faintly glowing relic of the hot, dense, young universe. Credit: Nicolle Rager Fuller, NSF. 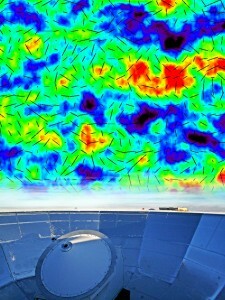 By measuring the way the light of the CMB is polarized, a team led by Sarah Church of the Kavli Institute for Particle Astrophysics and Cosmology at Stanford University and by Walter Gear, head of the School of Physics and Astronomy at Cardiff University in the United Kingdom were able construct a map of the way the Universe would have looked shortly after matter came into existence after the Big Bang. Their findings lend evidence to the predictions of the Standard Model in which the Universe is composed of 95% dark matter and energy, and only 5% of ordinary matter. Polarization is a feature of light rays in which the oscillation of the light wave lies in right angles to the direction in which the light is traveling. Though most light is unpolarized, light that has interacted with matter can become polarized. The leftover light from the Big Bang – the CMB – has now cooled to a few degrees above Kelvin, but it still retains the same polarization it had in the early Universe, once it had cooled enough to become transparent to light. By measuring this polarization, the researchers were able to extrapolate the location, structure, and velocity of matter in the early Universe with unprecedented precision. The gravitational collapse of large clumps of matter in the early universe creates certain resonances in the polarization that allowed the researchers to create a map of the matter composition. The measurements made by the QUaD experiment further constrain those made by previous experiments to measure properties of the CMB, such as WMAP and ACBAR. In comparison to these previous experiments, the measurements come closer to fitting what is predicted by the Standard Cosmologicl Model by more than an order of magnitude, said Dr. Gear. This is a very important step on the path to verifying whether our model of the Universe is correct. The researchers used the QUaD experiment at the South Pole to make their observations. The QUaD telescope is a bolometer, essentially a thermometer that measures how certain types of radiation increase the temperature of the metals in the detector. The detector itself has to be near 1 degree Kelvin to eliminate noise radiation from the surrounding environment, which is why it is located at the frigid South Pole, and placed inside of a cryostat. 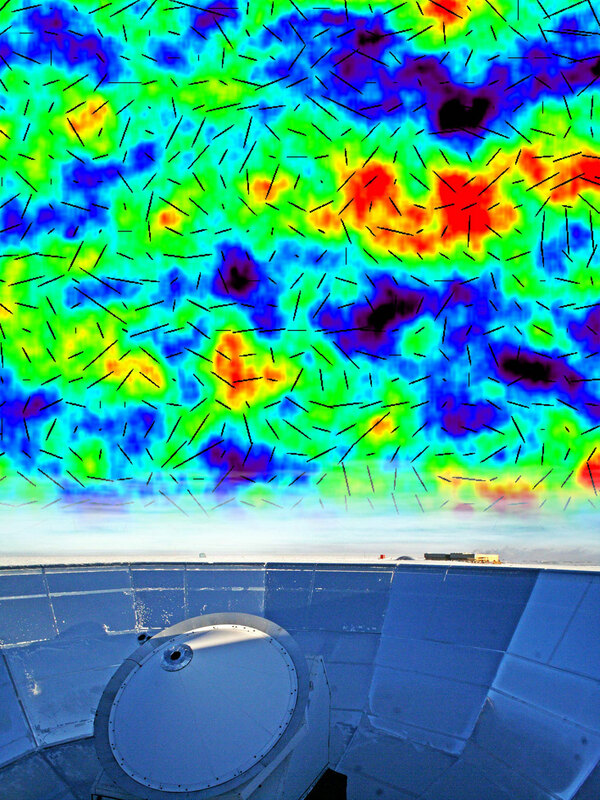 The results, published in a paper titled Improved Measurements of the Temperature and Polarization of the Cosmic Microwave Background from QUaD in the November 1st Astrophysical Journal, fit the predictions of the Standard Model remarkably well, providing further evidence for the existence of dark matter and energy, and constraining alternative models of the Universe.